It's not the first time I baked a Hummingbird Cake. This cake must be my favorite cake. It is so moist thanks to the bananas, has some freshness because of the ananas parts and the ever-needed crunch of the pecans. 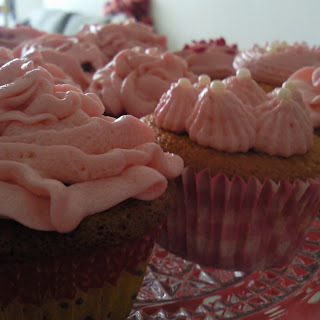 And, off course: cream cheese frosting! 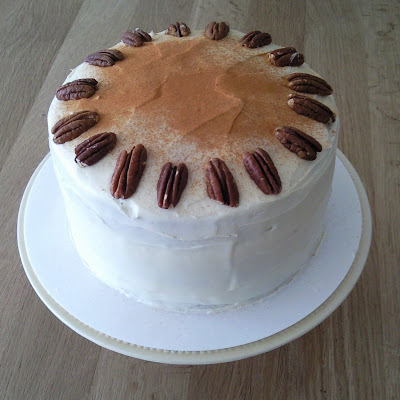 For the recipe of this scrumptios cake: see my Hummingbird Cake Cupcakes. When rains pour down all day, you have no other choice but to put some sunshine in your cupcake: mango and strawberries! The cake is a basic vanilla one, which is then filled with a puree of delicious mango and frozen strawberries. In season you can off course pick fresh ones. Preheat oven to 180°C and prepare your muffin pan. Place the butter, sugar and vanilla extract in the bowl of a mixer and cream for about 7 minutes or until mixture is light and airy. Add the eggs, one at a time mixing well after each addition. Mix for 2 minutes. Combine flour and baking powder in another bowl and then add it in to the sugar-butter mixture. Add milk and mix for another minute. 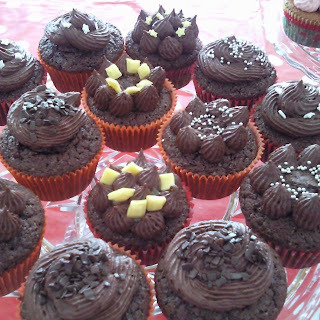 Fill the cupcake liners for 2/3 and bake for about 25 minutes. Let cool on the rack. To make the mango-strawberry puree you will need 1 mango and 5 strawberries. Blend them until they have the consistency you like. After the cupcakes are completely cool, cut a cone formed whole in them for the filling. Replace the top. 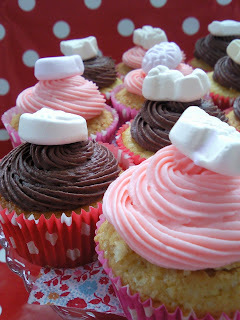 You can use a Mascarpone frosting with these cupcakes, as suggests The Love Bakery in the recipe. I used the classic Cream Cheese Frosting. This recipe must be the one I use most. Chocolate cupcakes always encounter a great success. It’s a simple recipe and gives perfect results. This time I tweeked it up by adding crushed oreo’s in the batter and the frosting. No quantities to give you there, just add as you feel like. Sift the flour, baking powder and cocoa powder and add a pinch of salt, the brown sugar, the vanilla sugar and the softened butter. Blend on low speed to obtain a sandy texture. Mix the cream with the first of the eggs and then add the other one. Pour half of this into the mixture and mix until smooth before adding the other half. Fill the baking cups to 2/3 and bake for 20-25 minutes. Cool 5 minutes in pan before removing from pan and continue cooling on the rack. Mix the softened butter with the icing sugar and cocoa powder. Add the milk and beat until light and fluffy. The longer the better! 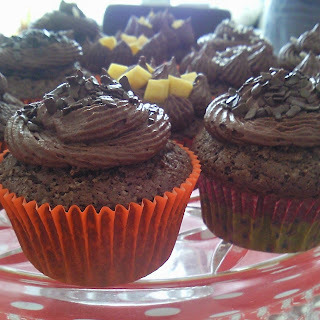 As promised the recipes of last week’s cupcakes! 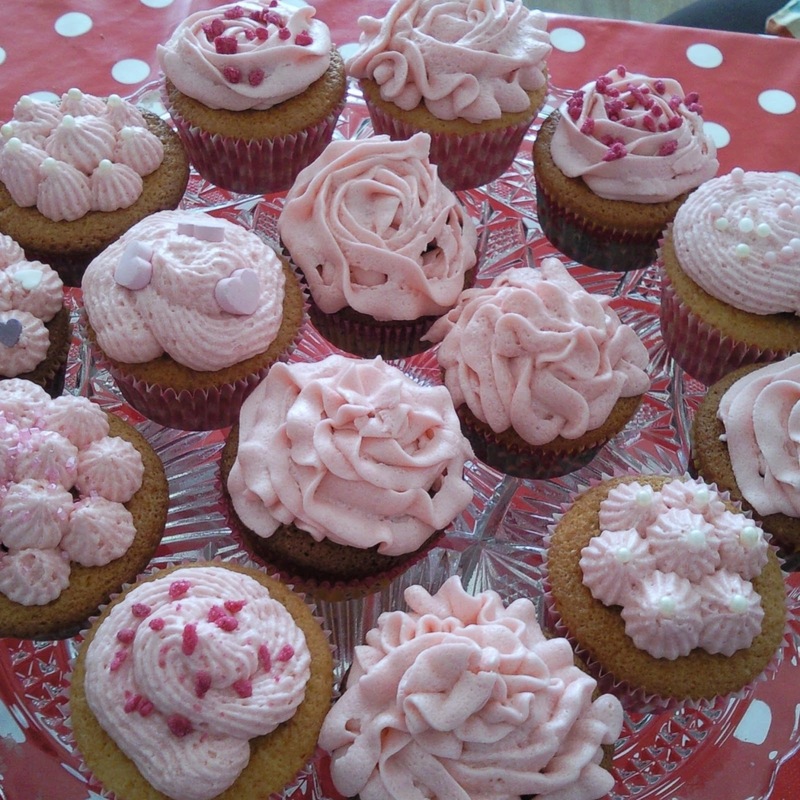 First of all the one for the Raspberry cupcakes. These were one of the first I made when I started baking 2 years ago. Preheat the oven at 170°C. Beat the butter and sugar until light and fluffy. Add the egg and mix until fully incorporated. Add the raspberry puree and mix. In another bowl sift the flower and baking powder and a pinch of salt. Alternately add the flour mixture and the buttermilk into the mixture. Fill the baking cups for 2/3 and bake in 20-25 minutes until a toothpick comes out clean and the cake springs back when pressed. Leave the cakes in the pan for 5 minutes before transferring them onto a grill to further cool them. For the frosting; mix the icing sugar and butter. Add the cream cheese and mix well on high speed. Pipe the frosting onto the cupcakes and decorated with some pearls. I always find it difficult to get the real red that makes a red velvet cake or cupcake. The new bought red liquid red might be easy to use but it definitely does not get me the red I wanted. But … as long as the cake is velvet, right? And velvety it is! Read with me for another successful Hummingbird Bakery recipe. 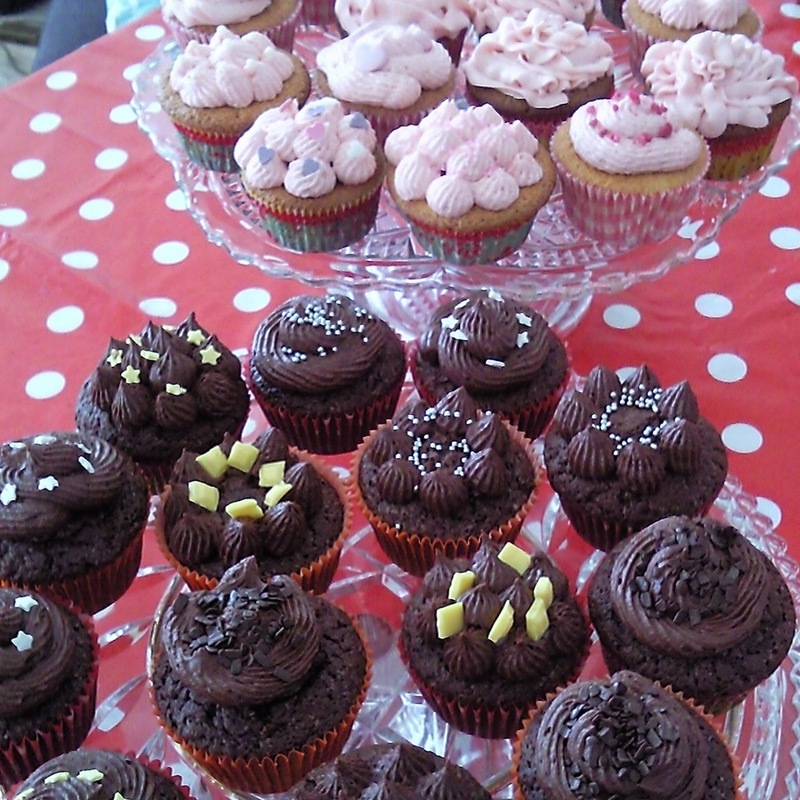 The recipe is for 12 to 16 cupcakes and is perfect for 2 20cm round baking pans. Grease and line your pans while you preheat your oven at 190°. Cream the butter and the sugar together until pale and fluffy (best cake related word ever). Break in the eggs one at a time, beating thoroughly after each addition and mixing in the scrapings from the side of the bowl. In a separate bowl, stir together the cocoa powder, food colouring and vanilla essence to form a paste. Add the paste to the batter, mixing thoroughly until the paste is completely incorporated. Sift together the four and salt in another bowl (yes you will need all the bowls so better have a dish washer or no fear of washing up), then add the flour to the batter in two batches alternating with the buttermilk. Lastly, in another bowl (told ya! ), mix together the vinegar and bicarbonate of soda (and look closely what happens here: baking is chemistry!) by hand and add it to the cake batter mixing it in until it is fully incorporated. Spoon the batter into the prepared baking pans. To make sure that each pan has the same amount of batter, I use (as I do to fill cupcake cases) an ice cream spoon: around 10 each will do. Place in the oven and bake for 20-25 minutes. Allow to cool for a while before removing the cakes from the pan to continue cooling on a rack. 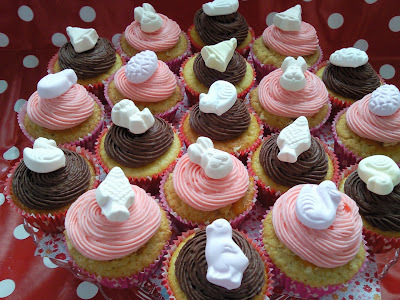 Beat the butter and the icing sugar together until no large lumps of sugar remain and the mixture is sandy in texture. Add the cream cheese and mix together slowly until everything is incorporated, then increase the speed to medium and beat the frosting until it is soft and fluffy (yep! Again). I choose to cut both cakes into two layers and spread a thin layer of frosting between every layer. If you prefer thick layers of frosting you can choose to leave the cakes as they are and just stick them together with lots of cream cheese frosting.